I didn’t set many reading resolutions in the past couple of years mainly because I’ve noticed that each year many of these goals were never achieved. Maybe I stretched too much when I set the resolutions or perhaps some unexpected interferences prevented me in achieving them. With fewer goals in sight last year was a success in this matter and with little set for this year too I was thinking that one reading resolution I would certainly like to be able to make and fulfill is to catch up with some of the authors and series I became fond of in the past few years and for some reason were left on the bookshelves of my personal library. One of such examples is Jasper Kent’s series, “The Danilov’s Quintet”. I loved Jasper Kent’s debut novel, “Twelve”, when it was released and although it took me a while to read his second I enjoyed “Thirteen Years Later” too. However, once again I find myself behind with Jasper Kent’s novels and “The Danilov’s Quintet” series, not only that I didn’t manage to catch up with “The Third Section”, but also I don’t have much chances to read the novel in time for the fourth release of the series, “The People’s Will”, due to be published by Bantam Press UK on 23rd of May. Reflecting on this situation I came to the conclusion that I can set a new reading resolution for 2013. Without forcing to achieve a fix number of books or risking an overvaluation of my reading potential I’ll try to catch up with some of the series I left behind lately, starting with Jasper Kent’s novels. I can try to do so in time for the release of “The People’s Will”, but like I already said the chances are slim. Anyway, I like that “The Danilov Quintet” shapes itself nicely, with another wonderful book cover made by Paul Young following the trend of the series and with an attractive synopsis for the fourth installment. Although I will certainly miss Captain Aleksei Ivanovich Danilov there are plenty of other reasons to see where Jasper Kent’s series is going. Turkmenistan 1881: Beneath the citadel of Geok Tepe sits a prisoner. He hasn’t moved from his chair for two years, hasn’t felt the sun on his face in more than fifty, but he is thankful for that. The city is besieged by Russian troops and soon falls. But one Russian officer has his own reason to be here. Colonel Otrepyev marches into the underground gaol, but for the prisoner it does not mean freedom, simply a new gaoler; an old friend, now an enemy. They return to Russia to meet an older enemy still. In Saint Petersburg, the great vampire Zmyeevich waits as he has always waited. He knows he will never wield power over Tsar Aleksandr II, but the tsarevich will be a different matter. When Otrepyev delivers the prisoner into his hands, Zmyeevich will have everything he needs. Then all that need happen is for the tsar to die. But it is not only the Otrepyev and his captive who have returned from Geok Tepe. Another soldier has followed them, one who cares nothing for the fate of the tsar, nor for Zmyeevich, nor for Otrepyev. He has only one thing on his mind – revenge. And it’s not just Zmyeevich who seeks the death of the tsar. Aleksandr’s faltering steps towards liberty have only made the people hungry for more, and for some the final liberty will come only with the death of the dictator. They have tried and failed before, but the tsar’s luck must desert him one day. Soon he will fall victim to a group that has vowed to bring the Romanov dynasty to a violent end – a group that calls itself The People’s Will. 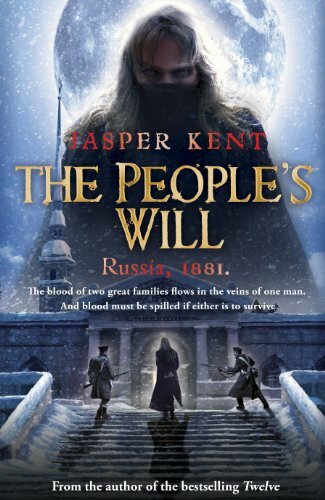 To celebrate the release of the new novel Jasper Kent is holding a competition on his website for a signed first edition of “The People’s Will” and a signed edition of “The Third Section”, in either English or Turkish, both prizes coming with a dedication of the winners’ choice. The competition is open until Sunday 12th May 2013 and in order to enter in the contest for one of the two prizes you need to answer one question related to “The Danilov Quintet” series. The question, the rules and the email address where the correct answer has to be sent can be found at this page on Jasper Kent’s website. Good luck! the "Danilov Quintet" is an excellent series. Like you I read and enjoyed "Twelve" and "Thirteen Years Later". I own an unread copy of "The Third Section". I think it is a good solution to pass resolutions like to read 100 books in one year. I would like to know which other series you want to continue to read in 2013. I started to read "The Malazan Books Of The Fallen" but I got stuck in the second book. Thank you for the giveaway hint. Of course I will take part.